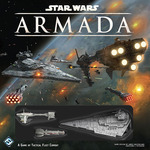 Rebel and Imperial fleets fight for the fate of the galaxy in Star Wars™: Armada, the two-player miniatures game of epic Star Wars space battles! Massive Star Destroyers fly to battle against Rebel corvettes and frigates. Banks of turbolasers unleash torrential volleys of fire against squadrons of X-wings and TIEs. Engineering teams race to route additional power to failing shields. Laser blasts and explosions flare across the battlefield. Even a single ship can change the tide of battle. all their own; the more powerful your ships, the harder it is to adjust their actions on the fly. Capital ships can’t easily vary their speeds or execute hairpin turns like the starfighters that buzz around them, so successful admirals must learn to master every aspect of the ships in their fleet and learn how best to implement their strategies well in advance of the initial engagement.